It seems as if a collar was forgotten last night. This is Dreizehn's other batman collar. It's from an Etsy seller, Faux Pawz. Dreizehn's first collar (red dinos) and Ruthie's only collar - poor girl - is from another Etsy seller who I LOVE, Chloe's Collars. Collar 2 (comics) and 10 (blue argyle) are from Collar Mania. The leather collars 4 and 6 are from Paco Collars. Collar 5, the leather Batman collar, and number 9 the tag collar are from Cali Girl Collars. Collar 7, the paracord collar and bracelet, are from our very own Jonsey'sMom. Collar 8 is from an Etsy seller but I don't know who. Last edited by NOX; 06-01-2012 at 01:40 PM. 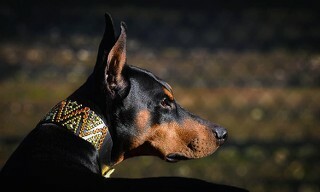 Amelia- its official Rupert is my favorite natural dobe. He looks great in every picture even showing off collars. I just love him. Damn all of you now I'm collar shopping...again. Hmmf, I love how you and kw blame me! A contagious one! Dang you anyway!!! I plan to... some day... Both dogs are on a collar hiatus (or at least I'm trying) until the fall since I don't have a steady income over the summer. Unless I'm able to win a contest, that is. For all those collars? Woman u are mad! Time to get shoppin! 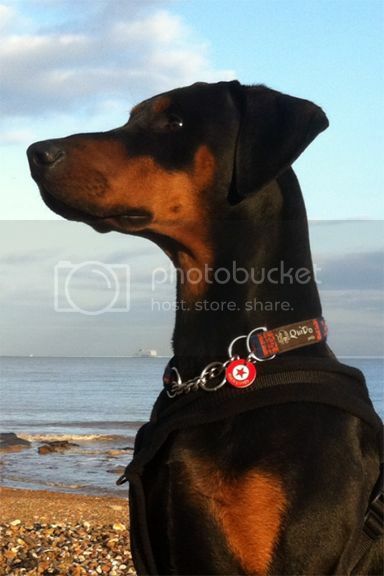 Rupert has loads of tags too...they have to match! Last edited by Amelia_; 06-01-2012 at 02:17 PM. Here are 2 of Nox's favorite tags! Yes, please share! My list will now include tags. Just don't tell hubby, he won't let me play with you all anymore! WOW that batman tag is GORGEOUS!! I've never seen anything like that before, I demand to know where you got it!! Ok just for you 2! Hope to see some new tags on your kids!! I've been wanting that Batman tag for SOOOOOOOOO long now. I cannot even tell you. I thought that it would match Dreizhens and ur batman outfits !! Ooooh....I love the bat signal name tag too!!! !